Variance Films releases Go For Sisters at the Village East Cinema on November 8th, 2013. 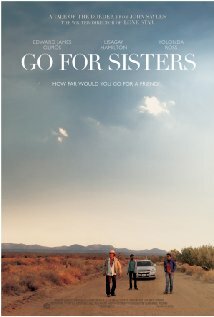 NYC MOVIE GURU: How fair do you think it is to classify Go For Sisters in a genre? John Sayles: A couple of times I made a movie that stayed close enough to genre or a world that you're familiar with like baseball in Eight Men Out. In this one, some of the earlier posters that Variance Films did has someone with a gun, but the movie doesn't pay off in those terms. The idea of it being a road movie with a detective thriller element to it isn't really accurate. What I do with genre is that I'm always aware of it. I'm aware that the audience has seen dozens of movies or so in that genre, so you have to be aware of what they're going to expect and what's going to be surprising, frustrating, satisfying or not. You always have to be aware of it even if you're subverting it or using it as architecture to tell a more personal story. NYC MOVIE GURU: Would the film work in black-and-white? JS: There's a wonder movie called Border Incident which was made around 1950 that uses the same Mexican actors who were the bad guys in The Treasure of Sierra Madre and it's in black-and-white. Touch of Evil is another one even though it wasn't shot in Mexico. I think it would work in black-and-white if we were still in the late 50's. Now, black-and-white is a little rarified and it feels that way when you're watching it entirely that way. NYC MOVIE GURU: Yolanda, how challenging is it to find a complex role for you? Yolanda Ross: It's ridiculously challenging for women and women of color that aren't trying to do stereotypes. When something like this is written and it's got your name on it, it's like the holy grail. It's unfortunately unheard of which is really crazy because it shouldn't be. There are a lot of black actresses who are very good, but are just not given the opportunity to work. NYC MOVIE GURU: Do you think there's a shortage of movies for adults these days? JS: That's mostly an economic thing which is that if 80% of movies going to theaters are in multiplexes, they make their money on the popcorn. That's what the mark-up is on. They want kids to buy a lot of popcorn and candy. They'll play Thor on 6 screens. It's mass-market business like McDonald's. 8 years ago, one of the studios said that they don't do dramas anymore. Drama is a very big category, but I knew exactly what they meant which is they do tent-pole movies, slacker comedies, horror movies and romcoms. That's what they knew that they could sale on a mass scale, so they gave up on the whole tradition of dramas. So, yes, there is a shortage. The other ways to get movies to people means that you don't get much money back, even if they do watch it and they do like it. NYC MOVIE GURU: Would something be lost by seeing Go For Sisters on the small screen? JS: Kat Westergaard, the cinematographer, did a wonderful job. When it goes wide, it goes wide. The place is part of the character. So, you always lose a little bit. It might be nicer because no one is texting next to you, though. NYC MOVIE GURU: Where in the spectrum of pessimism vs optimism do you find yourself? JS: There are no final victories and no final defeats. I try to be realistic about what's possible, but I also see that people come back from terrible things. There's some optimism in that. I think modern technology is a very ouble-edged sword. Information flows more freely more than it ever did, but so does disinformation.